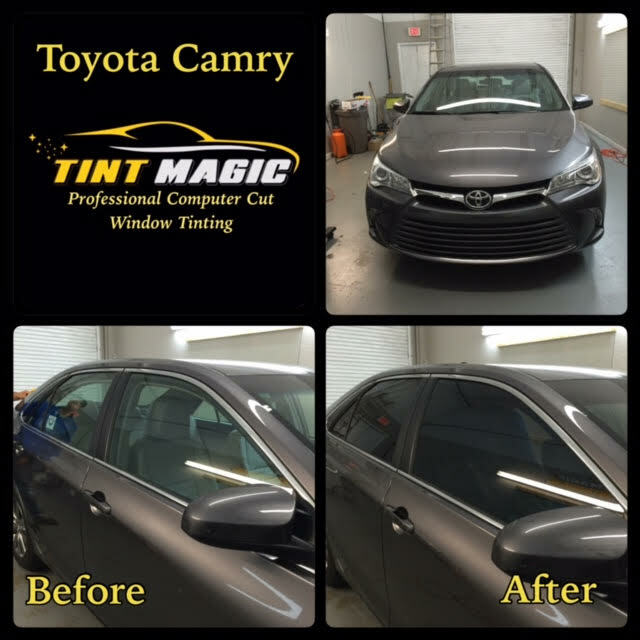 Toyota Camry at Tint Magic Window Tinting Coral Springs, we use high technology to pre cut any patterns in the market to ensure a perfect fit. Call us for a free estimate! 954-840-7883. Toyota has pledged to make its vehicles more engaging, with the bestselling Camry the latest to be called in for an overhaul. While the result is indeed a better Camry for 2015, the car proves that altering the essence of this refrigerator on radials is no simple task. The Camry’s latest freshening is substantial. All the bodywork is new save the roof, and the curves flow more organically than before. Most models carry a simple five-bar chrome grille, but a gaping, black-mesh snout distinguishes the sportier SE and new-for-2015 XSE trims. It’s a cyborg catfish, but one you can take home to meet the parents. Additional spot welds add rigidity to the structure, while thicker carpet padding and door inserts help tamp down road noise in the cabin. All variants get minor chassis changes, while the XSE—like our V-6 test car—gets extra starch, with firmer shocks and springs, harder bushings, and a sharper tune for the ­electric power steering. It remains family-car compliant, but the foundation feels more solid and isolated, with better body control and ride quality.